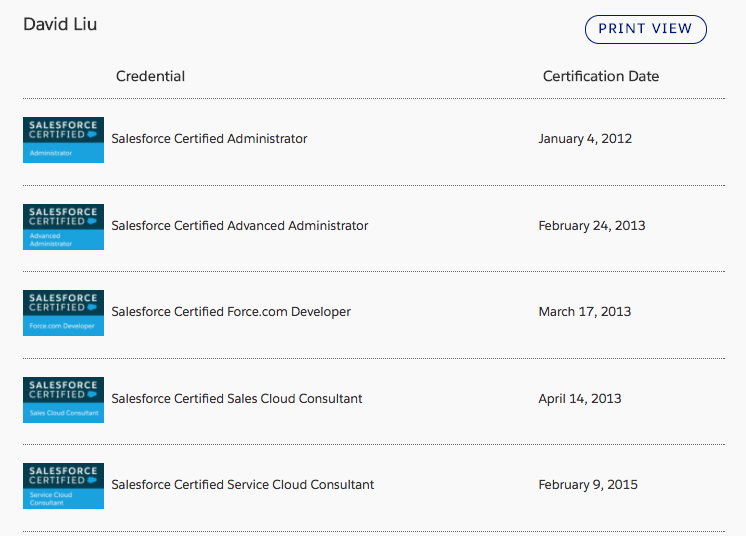 You can pass 15+ Salesforce certifications no matter what your background is! I’m grateful to have earned 16 certifications, and I sincerely believe that you can too. Work hard, follow these strategies, and you can have 15+ certifications in the next year. You might be thinking: Really, can I really do this? But I’m just a normal human being! Well these people thought the same thing too before they achieved great certification success! …and many more on the full success stories page! Looking for the former guide? My full certification verification page, in case you’re wondering! I read all the stories you posted including yours, they are so much inspiring and literally gave me some hopes in my life. I’ve been graduated on Dec. 2017. I was on Java before and decided to get on Salesforce by the end of last year. My goal is to get 5 certifications by the end of this February. I’ll gain the practical knowledge later but I need certifications to get started now. Could you please suggest me how to get started with Admin certification and the Dumps. Could you please suggest me the path for my success to get 5 certifications by the end of this Feb. I hope you respond me. Good luck Surya! Everything you need is in this guide! I want to write ADM 201 certification in feb 2019. Please help me how to prepare for the exam and id there is any study material if you can help me with clearing the exam. What certifications will the Apex Academy help me obtain? I am planning to take ADM 201 exam but i dont know from where to start my preparation. I am very confused stage really I need some guidence how to prepare for ADM 201 because I have good knowledge on Admin topics but i dont have proper guidence to give the exam. David, I have finished around 25 badges and 20,000+ points. I will be taking the exam soon. Thanks for all the great information on your blog. I wanted to share that I got my Service Cloud Consultant Certification yesterday and i am thankful to all the resources here and aspiring to complete the Advance Admin by end of this year!! Thank you for all you do and congratulations on the Golden Sweatshirt!! Truly deserving!! Could you please share the latest Service Cloud Consultant dumps! Thanks for the detailed insights into the 15 Certifications. However, I was looking specifically into information for Marketing Cloud Certification. There is loads of material available on Email Specialist. But very limited documentation for marketing cloud. Would you have some links for the Marketing Cloud certification ? I don’t have anything specific but check out quizlet.com! i. Any other virtual courses or tips or other resources you suggest? ii. I am thinking of spending 2-3 weeks of study time for this certification. Do you think that’s enough or I need more study time? I recently completed by ADM 201 certification and by my experience , I would suggest to follow David’s tips on how to clear the certification blog part and in particular , the flash cards . The resources you have mentioned for admin is quite sufficient. I’m yet to get into Sales cloud certification though. I did Trail head too but it gives more of an understanding for real time application . your posts are really motivating. I am a Salesforce Certifid Admin and I aspire to earn more and more SFDC certifications asap. For Admin, i enrolled for a online classroom training and with some self revision, i completed and passed admin exam in around 1.5 months. Now, next, i intend to go for Sales CLoud, Service CLoud, CPQ certifications. But i am not able to find any proper training programs. I also looked into Cert GUides from Salesforce but could not identify all topics where are need to concentrate for, lets say Sales CLoud certifications. I need to earn more and more certifications asap but not getting a proper direcction and material to prepare for exam. May i request for your guidance in this regard. If you’re looking to save $$$, then study study study! I got my admin 201. I am now planning to take developer PD1. I have zero coding experience and it feels good to know that one does not need developer experience. Any tips on the material to use to prepare for the same and which of the next certification, i can take? I am planning to take ADM 201 exam, but i am not getting proper training. I am very confused how to prepare for ADM 201. Can you please suggest what is the best way to prepare ADM 201 and i have good knowledge on salesforce admin. 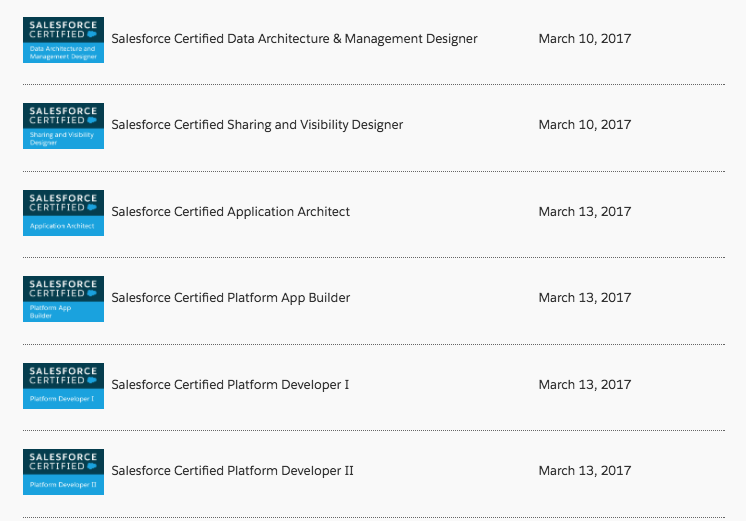 I just signed up for pluralsight and have begun the learning path regarding becoming a certified salesforce developer. Is the certification something that you offer as part of that subscription or is it separate? My name is Karthick and i am a marketing professional with some years of experience. I am interested in pursuing the following certifications: Salesforce Certified Marketing Cloud Consultant, Salesforce Certified Marketing Cloud Email Specialist, Salesforce Certified Marketing Cloud Social Specialist. My question is kind of silly. 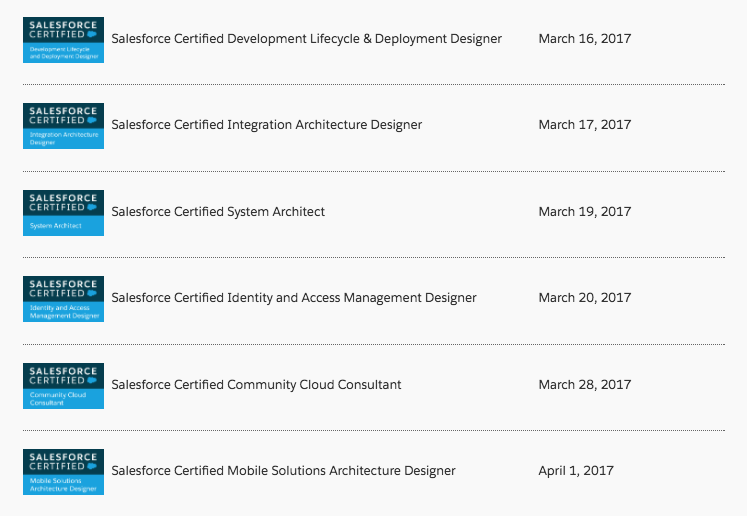 How do i get these certifications without an access to the marketing cloud tool? I only have the access to the developer edition & the trailhead community. Let me know your inputs. Are there any recent changes in admin or developer certification exams, is lightning included in these exams. Anyone who attended App Builder exam recently, could you share some tips and study materials. The Platform Developer 1 Certification wasn’t so bad. I’ll admit I have three years experience working with SFDC as an Admin, but have started dipping my toes into the Dev side with some complex projects that required apex, as well as a community cloud build out I’m working. Also, because at times I wonder why Salesforce is being Salesforce (aka Governor Limits, encountering errors and fixing them). I decided on a whim, to take a gamble and see if I could pass the Dev 1 cert. So I fired up SFDC99, Pluralsight, Apex Academy, Dan Appelman and Trailhead, plus attending Forcelandia…took it and wham! In just one shot, aced it! Six Certs now! Thanks A Million for all you do! I remember when you started your dev journey Medhanie. SUPER IMPRESSIVE how far you’ve come! Congrats on PD1 that is a MONSTER achievement! This is an amazing resource (in addition to your entire site) and I am so grateful to have it! I don’t have any certs yet but I’ve been working in Salesforce for three years and I think I might attempt my first one at Dreamforce this year. I’ll have to pass because failing would really put a damper on my week, ha. I’m an Apex Academy junkie but I think I am going to take it back to basics and get an Admin cert or two before diving back in to the developer world (read: apex got super hard and I got discouraged!) THANK YOU THANK YOU THANK YOU!!! hahaha thank you Olivia! Keep up the faith! So much information on your site. Thank you again for making this so clear. AP – email me at sschaffer@oprecruiting.com and I’d be happy to discuss with you. My team and I specialize in Salesforce hiring and would be happy to bounce some ideas around and connect you with folks looking to hire. Hey David, any suggestions for someone with six certifications on getting a job? I have the golden five and Platform Developer I. Yes! Find a good recruiter they will hook you up in NO TIME! !